“Project K-Nect continues to serve as a demonstration project highlighting the uses of smart phones to increase student achievement and decrease the digital access gap amongst students,” said John Shannon, Principal at Dixon High School. Onslow County high school students participating in the mobile learning program, Project K-Nect, are excelling in math classes, feel more prepared to learn math and are more interested in pursuing math education and careers, according to the latest program evaluation by Project Tomorrow®. Project K-Nect, developed by Digital Millennial Consulting and funded by Qualcomm’s Wireless Reach initiative, is designed to increase student achievement in math and close the digital access gap for students in Onslow County School System in North Carolina. The latest evaluation report highlights the findings from August 2010 through January 2011. As Project K-Nect entered its third year in Onslow County, the fall 2010 cohort was comprised of students and teachers from Algebra I, Algebra II and pre-calculus courses at Dixon High School and Southwest High School. During their participation in the Project K-Nect classes, students are given a smart phone with a data plan that allows for 24/7 access to the internet and Project K-Nect environment enabling them to be online and connected with their teacher and other students anytime in or out of school. For many of the Project K-Nect students, the smart phone provides a much needed connection for help and support, first with the teacher, and subsequently with other classmates; as well as access to additional resources to support their learning. This is especially critical for students who have not previously felt successful in math, according to a Project K-Nect Algebra I teacher. “This report highlights the power and promise of mobile learning initiatives where students can be connected anywhere, anytime to internet resources, their teacher and classmates,” said Suzette Kliewer. 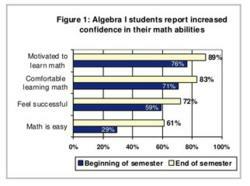 By the end of the fall 2010 semester, 89 percent of the Algebra I students reported they are more motivated to learn math compared to 76 percent at the beginning of the semester. The majority of students reported they are also more comfortable learning math (83 percent), felt more successful (72 percent) and better prepared to take the end-of course exam (72 percent). By the end of the semester, the number of students who thought, “math is easy” more than doubled from 29 percent to 61 percent. Students demonstrate proficiency on End-of-Course Exams. 90 percent of the Project K-Nect students in Algebra I and 100 percent of the Algebra II students demonstrated proficiency on their end of course exams. The first cohort of Project K-Nect students successfully completing the college level AP Calculus college curriculum and took the AP exam last month. Students express an increased interest in college and math related degrees and careers. Algebra I students expressed an interest in taking additional math classes, including Advanced Placement courses. They also said they are more interested in attending college (56 percent) or pursuing a degree or career that would use their math skills (33 percent). While 100 percent of the Algebra II students report they have fast Internet access at home, about 30 percent of the Algebra I students still do not have this same level of access. Students increased use of and familiarity with technology through Project K-Nect helps students easily integrate the use of technology to other curricular areas. Project K-Nect teachers use many of the standard features of the smart phone, as well as algebraic problem sets and a mobile-enabled suite of tools for sharing student work, facilitating collaboration between students and assessing student activity and growth. To help students master math concepts, teachers are encouraged to create problem-based lessons and activities that utilize the features and functionality of the smart phones as well as the Project K-Nect environment. Project K-Nect teachers use the phones to facilitate collaboration through blogs, instant messaging and email. Students use the digital photo and video capabilities of the smart phone to capture their problem-solving strategies and then post them to the Project K-Nect site for subsequent discussion and review. In Algebra I, students also have the opportunity to use their smart phone to learn key algebraic concepts as they solve unique problem sets from the Project K-Nect library. Project Tomorrow, the national education nonprofit organization dedicated to empowering student voices in education discussions, prepared this program evaluation for Digital Millennial Consulting. Project Tomorrow has 15 years experience in the K-12 education sector and regularly provides consulting and research support to school districts, government agencies, business and higher education about key trends in K-12 science, math and technology education. Learn more at http://www.tomorrow.org. Project K-Nect was designed and implemented by Digital Millennial Consulting. The initiative represents a successful reference design for mobile learning in the United States. The initiative delivers managed instructional activities and support services to teachers and students via smart phones and wireless carrier 3G or 4G network infrastructure. Implemented in several North Carolina school systems Project K-Nect has yielded significant academic gains for student participants and has had a ‘transformative’ impact on teachers involved in the program. For more information, please visit http://www.projectknect.org or http://www.digitalmillennial.com. Qualcomm believes access to advanced wireless voice and data services improves people's lives. Qualcomm's Wireless Reach initiative supports programs and solutions that bring the benefits of connectivity to underserved communities globally. By working with partners, Wireless Reach projects create new ways for people to communicate, learn, access health care, sustain the environment and reach global markets. For more information, please visit http://www.qualcomm.com/wirelessreach.